My name is Rachael, and I am a stay-at-home mom trying to raise children and a husband, and help keep us afloat financially during tough economic times. Since we are a single-income family, sometimes it can be hard to make ends meet financially. I have worked full-time and part-time in the past, but find the most satisfying kind of work is when I am at home with my children. After babysitting children who behaved horribly, and trying to find other means of making additional income, I came up with an idea--I would make homemade dog biscuits. I have noticed over the past several years consumers leaning more towards organic diets. I have also noticed the way people pamper their pets and treat them like members of their own families. 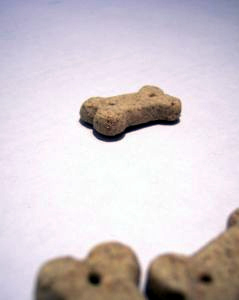 I had been making my own dog biscuits for a few years, and all of the ingredients I used were natural and organic. It occurred to me that I might be able to market the dog treats and sell them. All I needed were a few ingredients which could be purchased at the local supermarket, and the space in my kitchen, and I was set to go with very little overhead costs. I made several batches of my organic dog biscuits, and packaged them in pretty bags and gave them a unique name. After taking a photo of my product and giving a little background on the dog biscuits and my operation, I posted the product on eBay. I started off with just 5 batches of dog biscuits, as I wasn't sure how popular they would be. The first 5 batches sold the first day, and I made a profit of around $15--$3 per batch. While it wasn't a huge amount, just 6 days of work per month earned my family an extra $100. The best part of my own business adventure, is I decided when and how much to sell. While there certainly could be demand for more, and I could earn more money by making more dog biscuits, I only have to do what I am comfortable with. It cost very little money to bankroll my operation, and I get out of it whatever I feel like putting into it. A great way to earn a little extra cash!